Whether you're looking for a hay barn, shop, boat, R.V. or tractor storage, garage, storage shed or any other type of structure, Smokey Creek Barns can meet your needs. The metal framed construction combined with metal siding offers low maintenance and long-term durability. 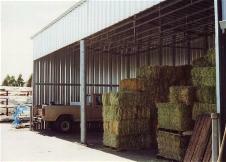 Our buildings not only protect your equipment and hay they look great and enhance your property's value.